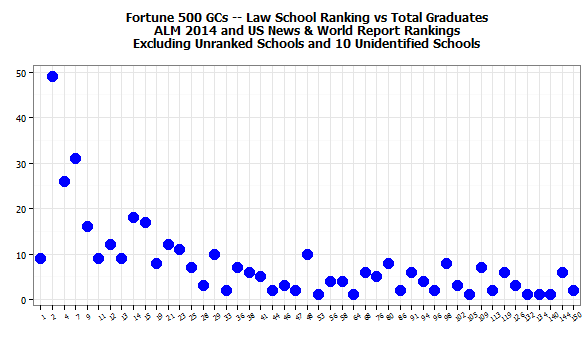 Setting aside the number of students in each class of the ranked law schools, is there any pattern in the number of graduates who are Fortune 500 general counsel according to the law school’s rank? The plot above shows the number of graduates by the height of the blue dots and the left axis; the ranking of the schools ranges from number 1 on the left to 150 on the right. Bear in mind that when two schools have the same rank, this plot combines their graduate numbers. Unranked schools are not included. The evident pattern appears to be that higher ranked schools have more F500 GCs, and the number of GCs per school declines as rankings go lower – until a third of the way across the numbers plateau. Your eye can fill in a line that starts high left, and drops down to about 30, at which point it levels off to the right side of the plot. From about a ranking of 30 on, the numbers bounce around randomly and fairly consistently. One might conclude from this specialized sample that if you didn’t graduate from a very elite law school, it doesn’t matter much if your goal is to reach the top rung of a Fortune 500 legal department. A better way to depict the line would be with a trend line and confidence levels. But, that treat we hold for another post.